I have been advised by the Chief of Keppoch that this history is not accurate. The Chief and his Seanachaidh are collaborating in re-writing the first authentic History of the MacDonalds of Keppoch. SL0GAN: Dia ‘s Naomh Aindrea. PIBROCH: Ceapach na fasaich, and Blar Mhaol rua’. AN interesting subject for the pen of the Scottish historical student would be the mass of evil consequences, extending for centuries afterwards, which flowed from the moral indiscretion of Robert II., first of the Stewart kings. As a warrior and a statesman the Stewart was in every way worthy of his grandfather, King Robert the Bruce. It was his private conduct, in the matter of his conjugal relationships, which entailed such endless woes upon his descendants and upon Scotland. Though legitimated by a Papal dispensation in 1347, eight years before his second marriage, there can be no question that the Stewart’s early connection with Elizabeth Mure of Rowallan was irregular. Out of this fact arose the claim of the children of his later marriage with Euphemia Ross, the Earls of Strathearn and Atholl, to be the proper heirs of the Crown, a claim which brought about the assassination of James I. and the terrible Douglas Wars against James II. At the same time, by their own acts the children of Elizabeth Mure brought a heritage of woe on Scotland. The eldest son, John, ascended the throne as Robert III., but the third son, the ambitious, able Robert, Duke of Albany, ruled the country, secured the death of Robert III.’s elder son, by starvation, at Falkland, and the capture and long imprisonment of the king’s second son, afterwards James I., by the English, for which betrayal a fearful nemesis was suffered by his own son and grandsons on Stirling heading hill. Elizabeth Mure’s fourth son was the savage Alexander Stewart, Earl of Buchan, better known as the Wolf of Badenoch, whose defiance of the laws of God and man kept the northern half of Scotland in fire and bloodshed for more than twenty years. To mention only one other of the twenty-one children of Robert II., his eldest daughter Margaret, who was married to John, Lord of the Isles, in 1350, carried with her what seems to have been nothing less than a curse. To make way for her, the Lord of the Isles set aside his first wife, Amy MacRuari, with her children, and from that day the misfortunes of the great House of the Isles began, and the downfall of the whole race of Macdonald. It was Margaret Stewart’s son, Donald of the Isles, who married a sister of the Earl of Ross, and on that Earl’s death claimed the Earldom. This was claimed also by his uncle, Robert, Duke of Albany, for his own younger son. To assert his claim Donald, in 1411, marched across Scotland and fought the bloody battle of Harlaw, where he was defeated by his cousin, Alexander Stewart, Earl of Mar, eldest natural son of the Wolf of Badenoch. It is true that in 1431, the tables were turned, when the same Earl of Mar was defeated by the Islesmen, under Donald Balloch, in the fierce battle of Inverlochy; but the victory brought down upon Alexander, the next Lord of the Isles, Margaret Stewart’s grandson, condign punishment at the hands of his other cousin, King James I., and the misfortunes of the house went from less to more, till in 1493 John, "fourth and last" Lord of the Isles, died a forfeited and landless man in Paisley Abbey or Dundee. In these matters the Macdonalds of Keppoch shared the misfortunes of the great House of the Isles from which they had sprung. Their ancestor was Alastair, third son of John, Lord of the Isles, and Margaret Stewart, daughter of King Robert II. 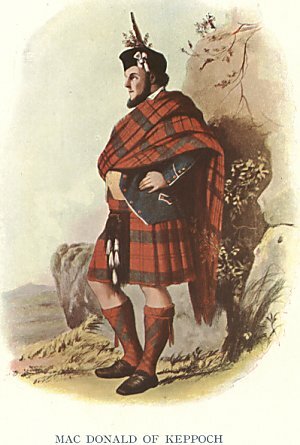 Angus Og, the father of John of the Isles, who figures as the hero in Scott’s poem, had received from King Robert the Bruce, as a reward for loyal support, the lands of Morven, Ardnamurchan, and Lochaber, forfeited by his kinsmen the MacDougals of Lorne, and John of the Isles made his third son Lord of Lochaber. In a deed of 1398 Alastair is termed "Magnificus vir et potens," and for three hundred years his descendants were known as the race of Alastair Carraich. It was not till the end of the seventeenth century that the Keppoch Chief, Colla MacGillieaspuig, on the persuasion of his kinsman, the Glengarry Chief, Lord MacDonell and Aros, resumed the family name of Macdonald. The stronghold of the Macdonalds of Keppoch stood on high ground at the meeting of the Roy and the Spean, where, within the last hundred years the fruit trees of their old garden continued to blossom and bear fruit. Meanwhile much water had flowed past the walls of that Lochaber fastness. Notably in 1431 while Alexander, Lord of the Isles, lay a prisoner in Tantallon, and his mother, the Countess of Ross, was immured on Inchcolm, Alastair Carraich joined the formidable invasion of the Islesmen under his cousin, Donald Balloch, Chief of Clanranald, which routed the Royal forces under Alexander Stewart, Earl of Mar, and the Earl of Caithness at Inverlochy. For this the lordship of Lochaber was forfeited and bestowed by James I. on his loyal supporter, the Mackintosh Chief, Captain of Clan Chattan. This grant proved a cause of trouble for several centuries. Like the MacGregors further south, the Macdonalds resisted the Mackintosh’s parchment tenure, and continued for the most part to hold their lands by the ancient coir a glaive, or right of the sword. Alastair Carraich’s son Angus, the second Keppoch Chief, had two sons, Donald and Alastair. Of these, Donald was slain in 1498 in a battle with the first Appin Chief, Dougal Stewart, and his son John earned the enmity of his clan by an act which the Highlanders invariably regarded as unpardonable. One of his tribe, having committed some offence, fled to him for protection. John, however, weakly handed the man over to the Mackintosh Chief, as Steward of Lochaber. By this act he sealed his own fate. The clan deposed him from the chiefship, and made his cousin and heir-male presumptive, Donald Glas, chief in his place. Ranald, the son of Donald Glas, met a still more tragic fate. Along with the Captain of Clan Cameron he took part, in 1544, in supporting the stout and capable John Moydertach, natural son of the late Chief of Clanranald, in his claim to the chiefship, which had been conferred upon him by his clan, in despite of the weak and unpopular legitimate heir, Ranald Gallda. For a time, while Moydertach was imprisoned by James V., Ranald was placed in possession of the Moidart estates by his mother’s people, the Frasers; but on James’s death and Moydertach’s return, Gallda fled, and his rival, helped by Keppoch and the Camerons. carried fire and sword through the Fraser country. These disorders brought into action the Earl of Huntly, as King’s Lieutenant in the North. With a force of the Frasers, Grants, and Mackintoshes, he drove out Moydertach and his raiders, and replaced Ranald Gallda in possession of his estates. On their way back Huntly’s forces separated in Glen Spean, and Lovat with 400 men went homewards by the Great Glen. There, at the head of Loch Lochy, he was intercepted by the Macdonalds, and in the terrible battle of Kin-Loch-Lochy, or Blarnaleine, had his force completely cut to pieces, and was slain himself, with his eldest son and the luckless Ranald Gallda. It was in the following year that the Earl of Lennox Invaded the West of Scotland in the interest of Henry VIII., and he found it easy to gain over John Moydertach and his allies. These transactions proved disastrous to Keppoch. In 1546, along with the Captain of Clan Cameron, he was secured by Mackintosh as Deputy Lieutenant and handed over to Huntly, who first imprisoned them at Perth, and afterwards carried them to Elgin, where they were tried and beheaded in 1547. Ranald’s son and successor, Alastair of Keppoch, was mixed up with the affairs of that turbulent chief, Sir James Macdonald of Islay and Kintyre, chief of clan Ian Vor, and last representative of the second son of John of the Isles and the daughter of King Robert II. When Sir James, after trying to burn his father and mother in their house of Askomull in Kintyre, was imprisoned in Edinburgh Castle, he made several attempts to escape. After the first of these he was confined in irons, and in the second attempt the irons severely injured his ankle as he leapt from the wall. At last, however, in 1615, by the help of Alastair of Keppoch and his eldest son, he succeeded in getting away. His estates in Islay had by this time been feued to Sir John Campbell of Cawdor, brother of the Earl of Argyll, and Sir James proceeded to raise his forces to make a last stand against the usurpations of the Campbells, who for centuries had been ousting the ancient House of the Isles from its heritage. In the struggle he was vigorously helped by Keppoch, and the affair caused an immense commotion in the Western Isles. In the end, however, the Earl of Argyll himself was brought from England, whither he had fled, it is said, to escape his creditors. Armed with the King’s commission he gathered his forces at Duntroon on Loch Crinan, drove Sir James and his supporters from Islay and Kintyre, and finally secured these territories as Campbell possessions. Keppoch seems to have followed his leader to Spain, and when they were recalled to London and pardoned by King James VI. in 1620 he received a pension of 200 merks, while Sir James got one of 1,000. Twenty-five years later, during the Civil Wars, the House of Keppoch was very active on the side of King Charles. When the King’s general, the Marquess of Montrose, made his astonishing march in the snows of winter to overthrow the pusillanimous Marquess of Argyll at Inverlochy, it was a member of the clan, John MacDonald, the famous lain Lom, the poet, who guided Montrose’s army through the difficult mountain passes. After the death of Montrose the bard of Keppoch composed a lament in his honour. At a still later day lain Lom played a dramatic part in another tragic episode in the history of his clan. The tradition runs that a Keppoch Chief, Donald Glas, sent his two sons to France to be educated, and died during their absence. On the return of the lads, Alastair and his brother Ranald, they were barbarously murdered, in September, 1663, by certain members of the clan, who took possession of their land. No one seemed disposed or powerful enough to avenge the crime: only the poet seemed to feel the outrage, and he exerted himself unceasingly to induce some chief to take the matter up. At last he managed to enlist the interest of Glengarry, who had recently been raised to the peerage as Lord MacDonell and Aros. By this chief a body of men was sent to Brac Lochaber, and the murderers were attacked in their dwellings and slain. The sequel is told in the inscription on a curious monument with an apex representing seven human heads which stands near the south-west end of Loch Oich. The inscription runs :—"As a memorial of the ample and summary vengeance which, in the swift course of feudal justice, inflicted by the orders of the Lord McDonell and Aross, overtook the perpetrators of the foul murder of the Keppoch family, a branch of the powerful and illustrious clan of which his lordship was the Chief, this monument is erected by Colonel McDonell of Glengarry, XVII. Mac-Mhic-Alaister, his successor and representative, in the year of our Lord 1812. The heads of the seven murderers were presented at the feet of the noble chief in Glengarry Castle, after having been washed in this spring, and ever since that event, which took place early in the sixteenth century, it has been known by the name of ‘Tobar-nan-ceann,’ or ‘The Well of the Heads.’ "
In its chronology the inscription is somewhat astray, as lain Lom was not born till about 1620. At the Restoration in 1660 he received a pension, and he is sometimes referred to as the poet laureate of Charles II. He was present with the Jacobite army under Dundee at Killiecrankie in 1689, and celebrated the victory of the Highland army on that occasion in a poem, " Rinrory." Meanwhile the Macdonalds of Keppoch had been making history vigorously in their own way. In 1682 Archibald Macdonald of Keppoch died and was succeeded by his son Coll, then a youth at St. Andrews. After his father’s funeral Coll went to Inverness and tried to arrange terms to settle the old difficulties with the Mackintosh Chief. The latter, however, replied by throwing Keppoch into prison, and it took an order from the Privy Council to set him free. After this treatment Keppoch naturally refused to have dealings with Mackintosh, and in the end the latter procured a commission of fire and sword against him. It was in July, 1688, that the Mackintosh Chief, irritated by Keppoch’s refusal to pay rent and admit his authority, at last raised his clan, and, accompanied by a body of Government troops under Captain Mackenzie of Suddie, descended upon Brae Lochaber, and encamped on the height of Maol rua’, near Keppoch’s stronghold. The upshot, however, was far different from what he expected. His force numbered about a thousand men, while Keppoch had his own force increased by the Macdonalds of Glengarry and Glencoe and some Camerons. At dawn on the 4th of August Mackintosh beheld his enemies descending upon him from the ridge above. They charged without shoes, stockings, or bonnets, and did dreadful execution with their swords and Lochaber axes. Suddie was killed and Mackintosh himself taken prisoner, while his banner only escaped by its bearer leaping a chasm over which no one could follow him. The battle of Mulroy, which was the last clan battle in the Highlands, was celebrated with characteristic vigour by Ian Lom. Mackintosh complained to the Privy Council, which sent two companies of foot and a troop of dragoons into Lochaber to destroy the Macdonalds, "man, woman and child" and burn their houses and corn. The Macdonalds, however, managed to escape to the hills, from which they witnessed the destruction of their homes and crops. In the following year, Mackintosh having refused to join the Jacobite forces under Dundee, Macdonald had the satisfaction of driving off his cattle, and burning his new mansion of Dunachton. For his activity in cattle-raiding for the Jacobite army Dundee nicknamed Keppoch as "Coll of the Cows." In the interest of King James, Coll threatened Inverness with a force of 8oo men, but was drawn off by Dundee, and he led a thousand Highlanders to the battle of Kiliiecrankie. After the building of Fort William in 1690, however, he saw it to his interest to become reconciled to the law, and he entered into an arrangement with Mackintosh to pay a regular rent for his lands in Lochaber. He still, however, remained loyal to the Jacobite cause, and at the rising of 1715 he joined the Earl of Mar and fought at Sheriffmuir. It was the son of Coll of the Cows, Alexander Macdonald of Keppoch, who played a very notable part in the rising under Prince Charles Edward in 1745. At the Prince’s landing he was one of the first of the Highland Chiefs to declare for him, and it was in his country, at the bridge over the Spean, that the first shots of the rising were fired and two companies of Government soldiers taken prisoners. Keppoch himself led three hundred clansmen to the raising of the Prince’s standard at Glenfinan, and having been an officer in the French service he proved of very great value throughout the campaign, till the last onset at Culloden. Since Bannockburn the Macdonalds had claimed the place of honour on the right of the Scottish armies. At Culloden this was denied them, and from their assigned place on the left they refused in consequence to charge. As the critical moment was passing, Keppoch, who was their colonel, uttered the cry, "Have the children of my tribe forsaken me?" and rushing forward himself, sword and pistol in hand, received a bullet through the breast and fell dead. Following the battle, Lochaber was burned, houses, corn-stacks, and woods, with ruthless barbarity, by the red soldiers under the Duke of Cumberland, and two of the clansmen who went to Fort William to deliver up their arms and avail themselves of the proffered pardon were immediately hanged at a spot still pointed out near the mill. In 1752, however, Keppoch’s son, Ranald Og, petitioned for the restoration of his property on the ground that his father had fallen before the passing of attainder. He served in the Fraser Fencibles, each company of which was commanded by a chief, and he distinguished himself very highly at the siege of Quebec. The chiefs remained tenants of the lands of Keppoch till Major Alexander Macdonald had to leave, in consequence of quarrels with Sir AEneas Mackintosh. The representative of the ancient chiefs was afterwards lost sight of in America. Only less celebrated than Ian Lom was a poetess of the clan, Sheila Macdonald, daughter of Gillespie MacAlaistair Buidhe, sixteenth chief, who became the wife of Gordon of Baldornie in Aberdeenshire. In addition to her poetry she was a noted performer on the harp, and is said to have had the gift of improvisation. Septs of Clan MacDonald of Keppoch: MacGillivantic, MacGilp, Macglasrich, MacKillop, MacPhilip, Ronaldson, Ronald.